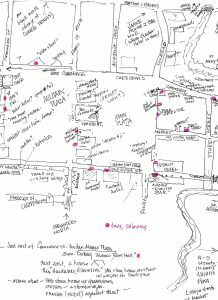 I made this map to locate as many of the businesses and buildings as possible (1865-70) from old photos and memoirs. Mary Maverick’s memoirs were helpful. It was fun, also demanding. Puzzling. The two plazas today are almost unrecognizable compared t this map and photos from that time. Noted all the bars and saloons with a red dot. There were certainly a lot of them. Will try for a clearer picture. 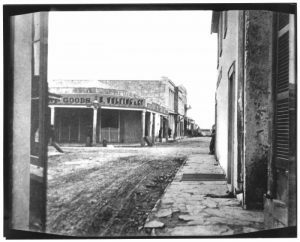 This is looking south on Soledad, about 1873. I think the cross-street is Market. The Plaza Hotel where Simon and Damon got a job making music would be behind the viewer. I think. It’s so wide-open, and now it is hard to see the sky for all the great multi-story buildings. This looks like many towns in Mexico, even today.